She’s full of unexpected sounds! She snores all the time (which I know firsthand because she sleeps with me every night), purrs like a kitten, and is a very noisy eater! She’s pretty socially conscious—not surprising, her platform is dedicated to rescue animal adoptions! We are launching an annual adoption event in the beginning of April in honor of her birthday (see details below). Her favorite pastimes are terrorizing her sister, Lily, playing tug-of-war, and looking for snacks. She also enjoys crunching plastic water bottles and playing fetch with a stick. She also loves watching TV shows and movies featuring animals—anything from Animal Planet to The Secret Life of Pets. 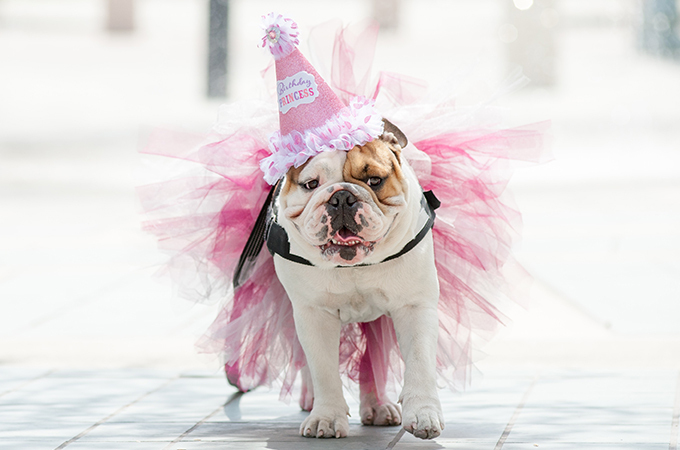 To commemorate our canine queen, we have planned a special birthday party on Thursday, April 5 from 12–1 p.m. in the Commons on the main University campus, followed by a rescue adoption event on Saturday, April 7 from 2–5 p.m. near the Orton fire pit. Throughout the week, we also will be giving away Addie merchandise on social media (you can catch us on Instagram, Facebook, and Twitter using the handle @urmascot). Due to “pup-ular” demand, we now have Addie merchandise available for purchase on her webpage, including PopSockets and socks. Many thanks to all of you who have welcomed Addie over the past year—it has been a real treat for both of us to be such a special part of our campus community! To request Addie’s autograph, schedule an appearance at an upcoming event, and much more, visit www.redlands.edu/adelaide.